The Mud Blog: Coast Dairies - new epic singletrack? Coast Dairies - new epic singletrack? The coastal Coast Dairies land and Sand Hill Bluffs in Santa Cruz is now officially public land and managed under California State Parks. 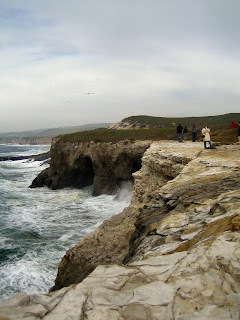 This includes 13 miles of incredible scenic northern Santa Cruz coastline! * State Parks will receive the approximately 400 acres coastside of Highway One and the historic Laguna Inn that may one day be the site of a visitors' center. State Parks will oversee the public's use of the popular beaches and will manage agricultural leases on the coastal side. *The federal Bureau of Land Management (BLM) will receive approximately 6,000 acres on the upland portion of the property, including the grasslands, redwood forests, and lands leased for grazing and the cement quarry. *The local non-profit group, Agri-Culture, will acquire the agricultural land inland of Highway One that was in agricultural production when the Trust for Public Land acquired Coast Dairies & Land Co. (CDLC) and its property in 1998 (approximately 550 acres). This is all exciting news and a great victory for public land, but has anyone heard if there has been any progress in allowing bikes on trails?